Reporting on the last year, and looking forward to the next. With your support, we’ve made an incredible difference for the broader ace community! Join us on a journey through the impact we’ve had last year, the direction we’re heading in 2017, and the ways you can support our life changing work. Last year, we simply couldn’t meet the incredible demand for our high school resources. For 2017, we’ve doubled our school resources budget to ensure more youth have access to these life-changing materials. Every week, we get emails from youth and their parents asking us to help them find ace-inclusive service providers in their area. These requests are increasing so rapidly that we’ve decided to contact each LGBT community center across the country to determine where inclusive services exist, and to build a database of supporters across the country that youth can use to find help. Toward the end of 2017, as we continue to build an increasingly connected movement of local ace community groups, we will begin the initial stages of a long-term national campaign to ensure ace-inclusivity wherever comprehensive sexual education curricula exists. In working with community groups from coast to coast, we’ve come to recognize that each has its own distinct strengths, but we’ve previously had no way of measuring those. What effective advocacy looks like in a local context, and what key steps can best establishing those advocacy efforts. Plan projects and develop advocacy campaigns. Aces from across Canada, the United States, and the United Kingdom came together for two days to build community, discuss the direction of the movement, and determine key advocacy focuses for the next few years. For the first time ever in our community, several high school students came to this event. 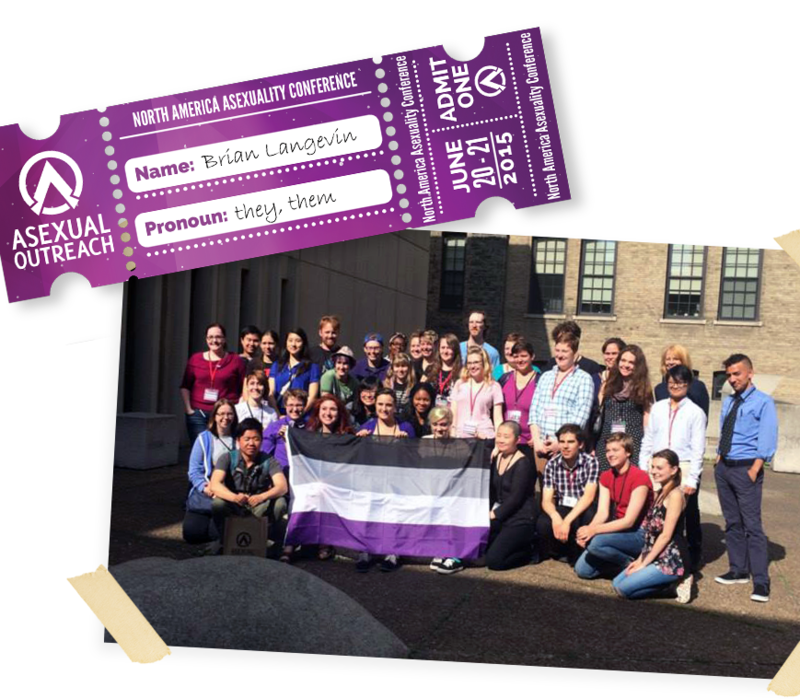 Their attendence highlighted a growing need to support the youth of our community – a need that Asexual Outreach continually works to fill. In the Summer of 2017, we plan to host a conference in Boston with a narrower focus than Toronto’s conference: bringing together one key organizer from every local ace community group across the United States and Canada. Over the course this multi-day event, we will foster discussions around local community organizing, allowing attendees to share their knowledge on effective community building and organizing. All of this will be built on top of the findings from our landscape community group study, ensuring communities leave with the key ingredients they need to strengthen their communities back home. As the first event to bring together every established local community group from across the United States and Canada, this conference allows us an unprecedented opportunity to transform our currently isolated communities into a connected, effective, and driven national network. We can only accomplish all of this with broad support from our community. By sharing this campaign with others, you can help us reach more members of the ace community, getting us closer to reaching our goal. Most of our 2017 programs have a low financial cost, but a high volunteer cost. You can significantly help us by offering to volunteer for a few hours a week. We’ll make sure it’s worth your while! You can support us most by donating once a month. This allows us to rely on consistent revenue to support our ongoing services, and allows you support us without having to donate everything all at once. Donating monthly is as simple as filling out a form, and you can easily change your amount or cancel at any time. If you are not able to give monthly, you can still support us with a one time donation. $7,454 pledged of $41,000 goal. $3,000 to restock all of our school resources, allowing us to send books, posters, and resources to schools across the nation. $1,700 to cover the costs for Asexual Outreach to attend and exhibit at Creating Change: a conference that brings together LGBTQ+ nonprofit organizations from across the United States. Attending Creating Change provides us the opportunity to connect with major LGBTQ+ organizations, furthering the ace advocacy movement on a broader scale. $30,000 to fund our community group organizers’ conference in Boston. Most of this budget will go toward funding flights and accommodations for organizers who otherwise could not afford to attend. **Our operational costs are in line with the standard for most nonprofits. As you can see, these costs do not take away from your donation’s impact; instead, they are central to our work, and will allow us to accomplish our 2017 goals.